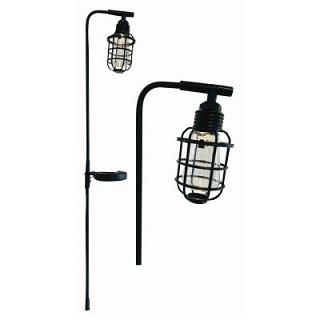 Classy vintage solar path light from Kingavon with a retro style Edison bulb with 1 white LED light. A wonderful garden feature the solar path light is manufactured from black powder coated metal + PP & PS material. The vintage solar path light comes with a manual on/off switch, 2V, 20mA solar panel & 1 x 1.2V AA 200mAh NiMH rechargeable battery.